Me gusta swimming en Espana! 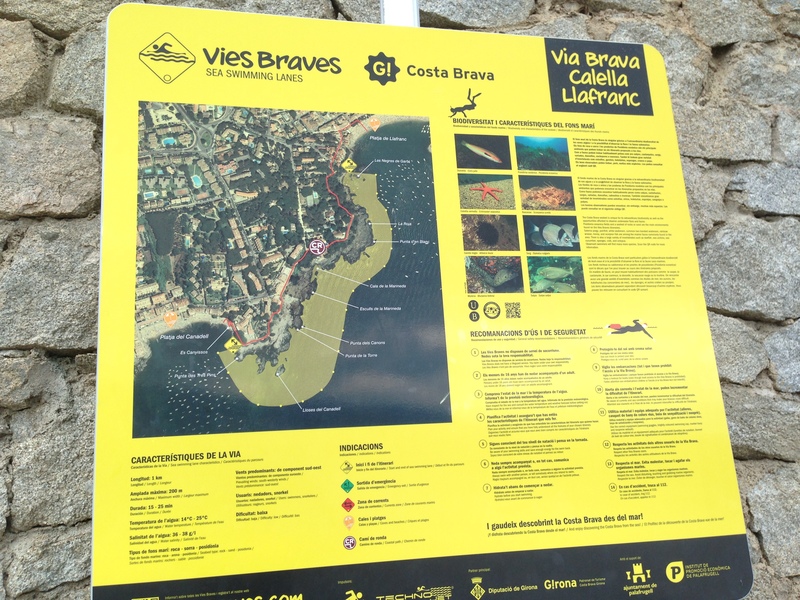 This entry was posted on October 24, 2014, in Open Water and tagged Cat and dog open water swimming, Cat riding a boogie board, Costa Brava open water swimming, Llafranc Spain, Swimming in Spain, Vies Braves Sea Swimming Lanes. Bookmark the permalink. As the weather in New England gets colder, but not cold enough to start dreaming about ski season, I am letting my mind wander back to our European vacation. 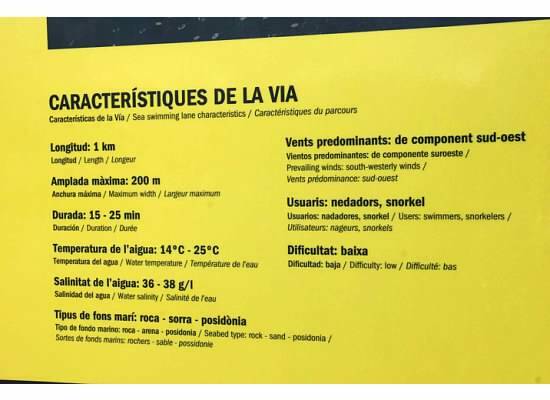 After my teeny swim in Lake Zurich, and after days of filling ourselves with pastry and baked goods in Paris, it was off to Spain. 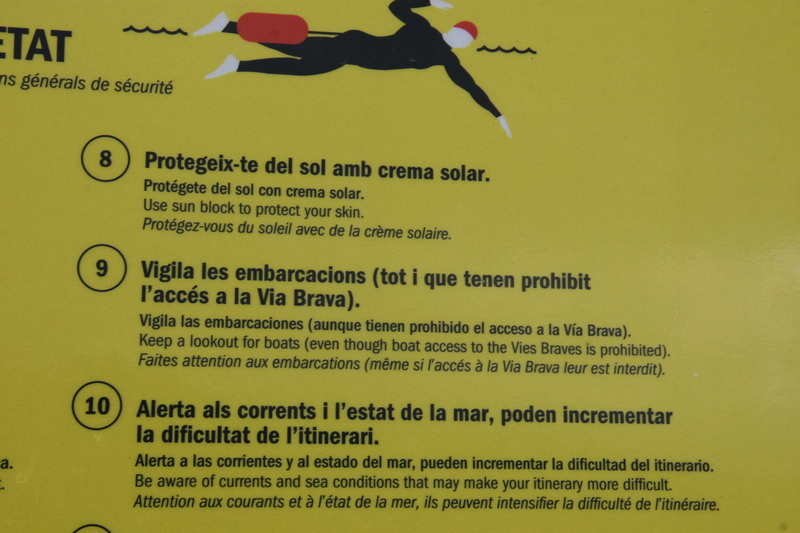 We’d opted for a few days on the beach in the Mediterranean, and I confess that I secretly hoped it would mean adding more swimming to our vacation. 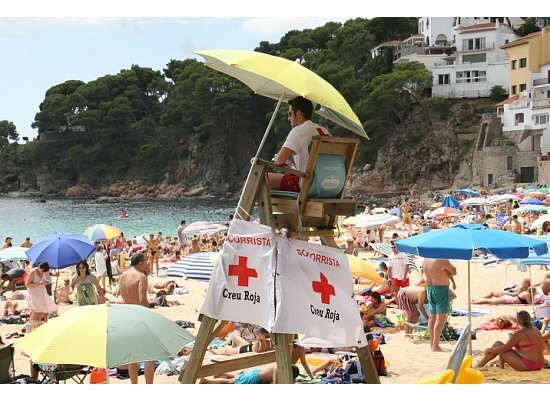 Fearful of packed beaches in August, we chose a small town called Llafranc, on the Costa Brava, approximately 45 minutes from Girona, and about an hour and a half from Barcelona. For us, it was a perfect option. 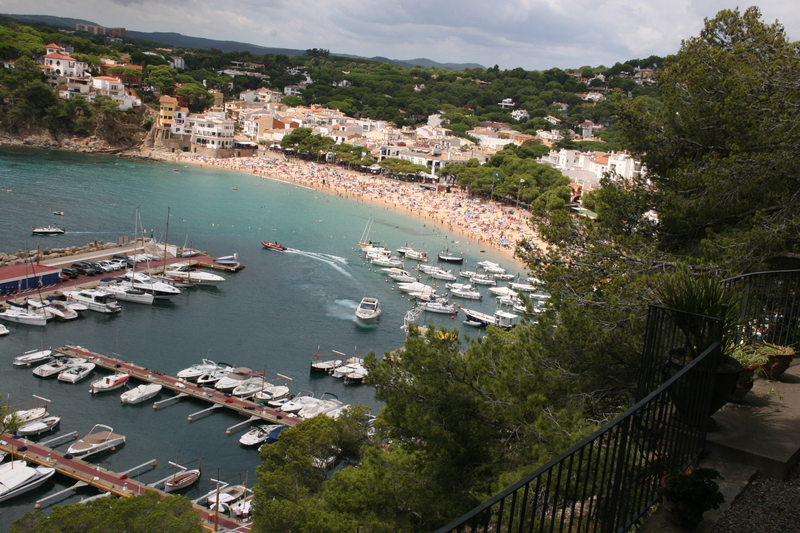 A small beach, sandier than some of the rocky options of the Costa Brava, and without the crowds of many of larger beaches. That is the not the same as NO crowds—it just means there were less. Yeah. Not empty. But manageable. Truly. And we would stake our our space each day, cozy and happy to relax after running around Paris. Our first full day, I went for my first swim since Lake Zurich. The water was chilly, probably around 70, but crystal clear. It was impossible to tell how deep the water actually was because of the clarity. Even with clouds overhead, the water was beautiful. 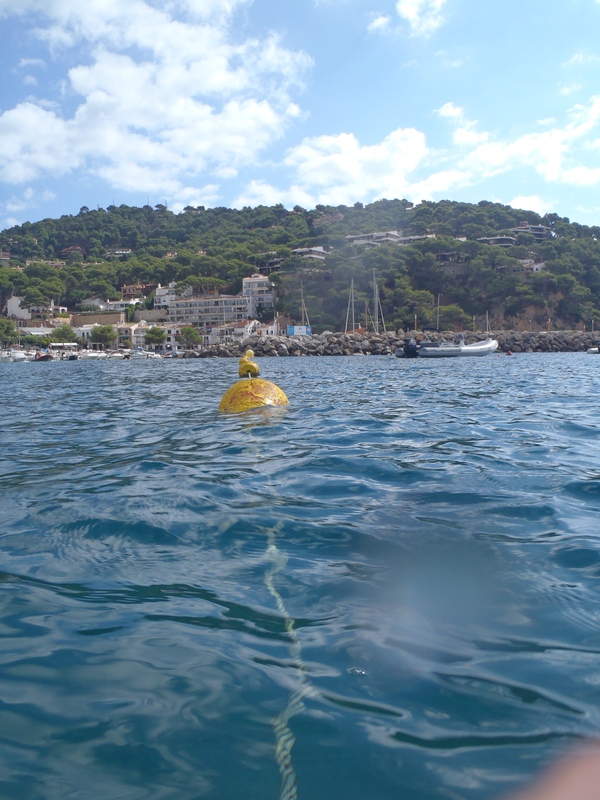 I swam back and forth along the yellow buoys marking the division between boat moorings and the beach area. 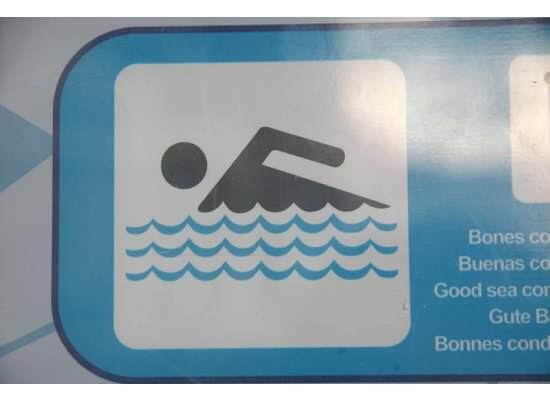 Most beaches in the U.S. do not have this and open water swimming can often be a study in vigilance as you swim and watch for jet skis and power boats. And there were many other swimmers, something that came as a bit of surprise since it’s not something I generally see when I’m at a tourist beach. 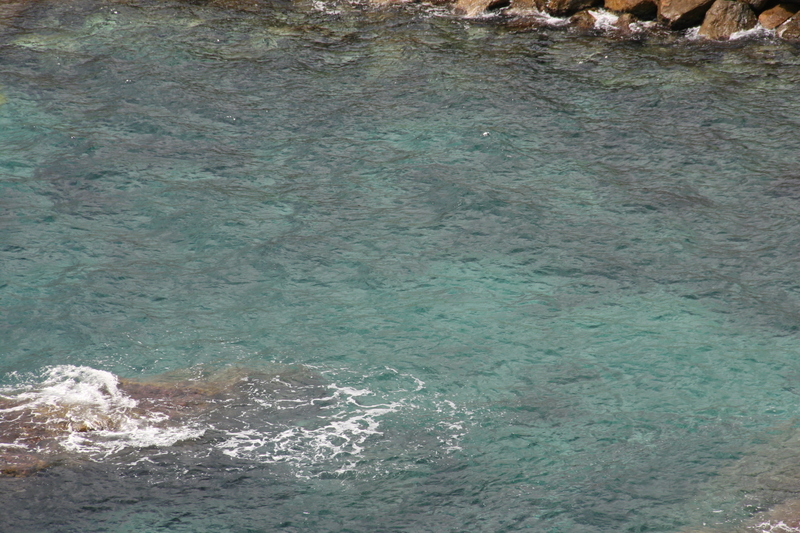 I finished my swim and noticed that there were other swimmers coming back from what had clearly been a longer swim, making their way around the outcroppings at the end of the cove where our beach was located. Curious, and slightly jealous, I wondered about the prospect of heading that way for another swim. I wasn’t sure though. John would not be able to be with me, and there was quite a bit of boat traffic. I filed the idea away for the next day and we decided to explore the trails that lead from town to town, a set of walking paths that are easy to navigate, clearly marked, and encourage you to explore the area. 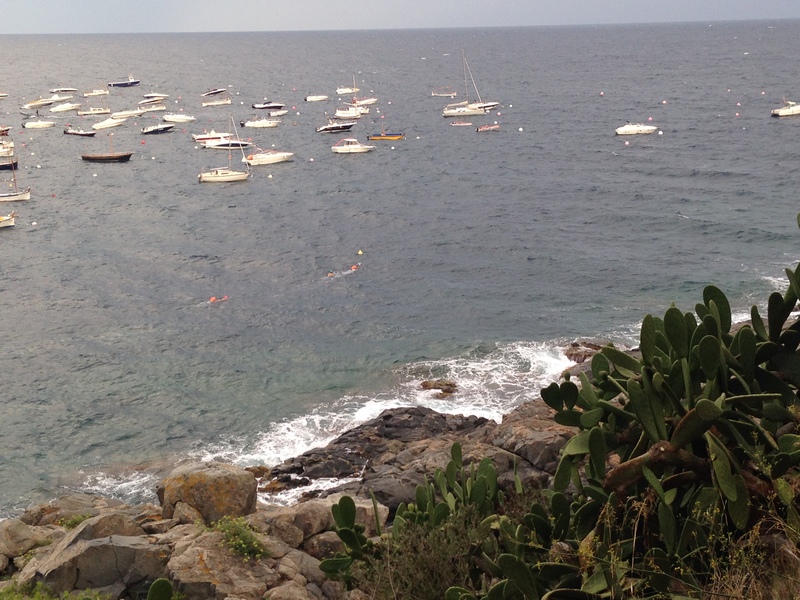 The views of the water were spectacular, and made me want to swim again. 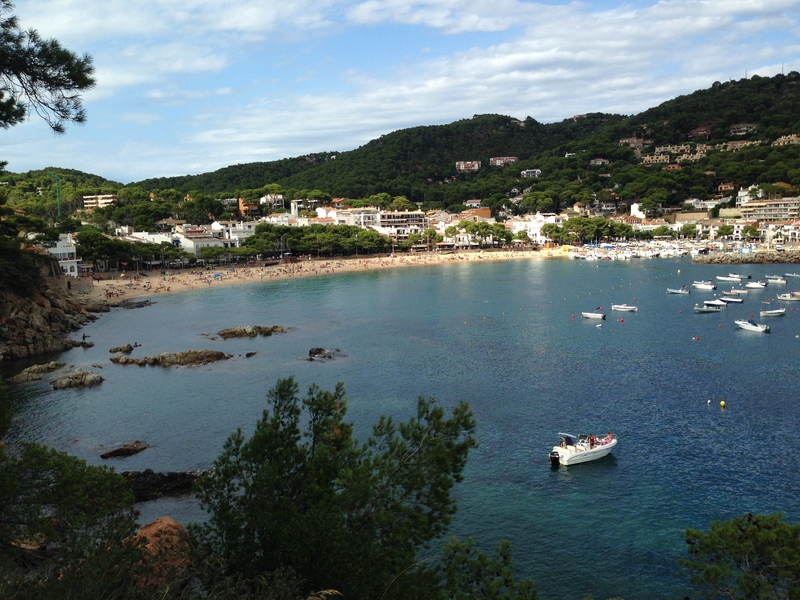 As we walked from Llafranc to the town of Calella de Palafrugell. 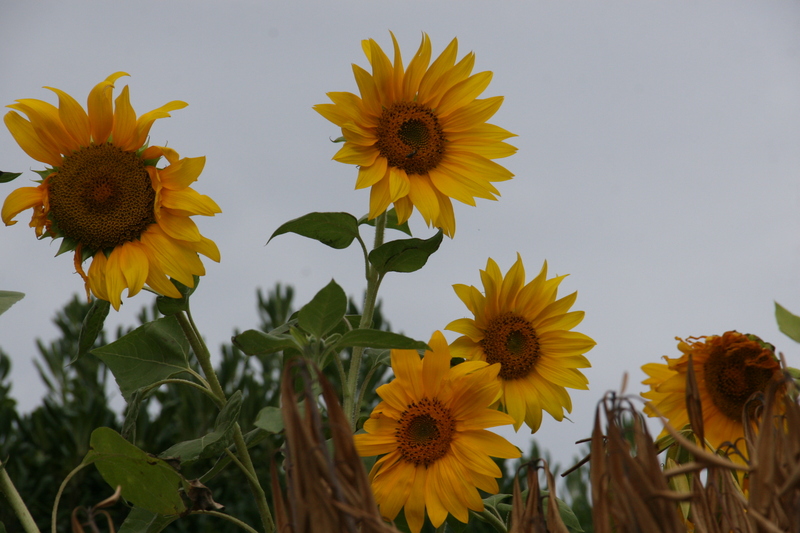 I noticed another set of yellow buoys, spaced at equal intervals from one another, and clearly marking something. I assumed it indicated shallows, letting boats know not to approach that area. 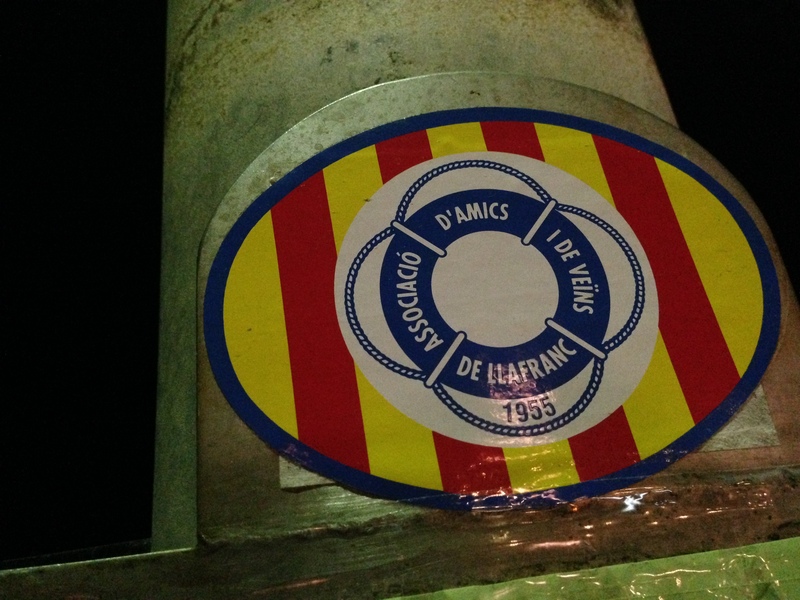 When we arrived at Palafrugell, it was a fantastic surprise to see a large sign telling us exactly what those buoys were. Yes! 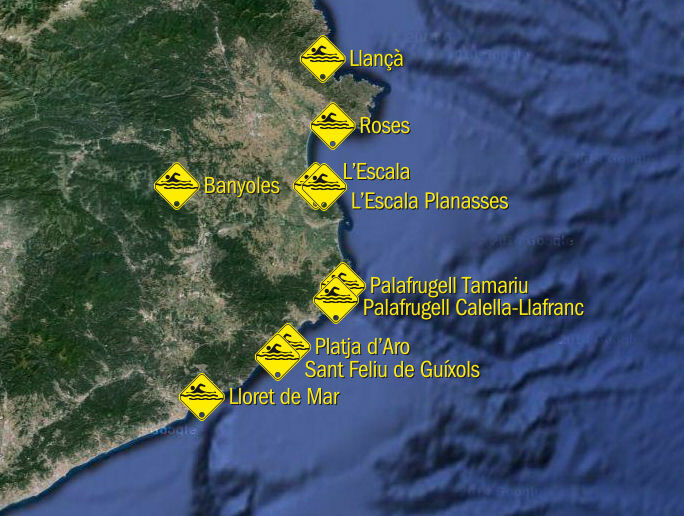 Actual open water swim trails! I have traveled quite a bit and I have never seen anything like this. 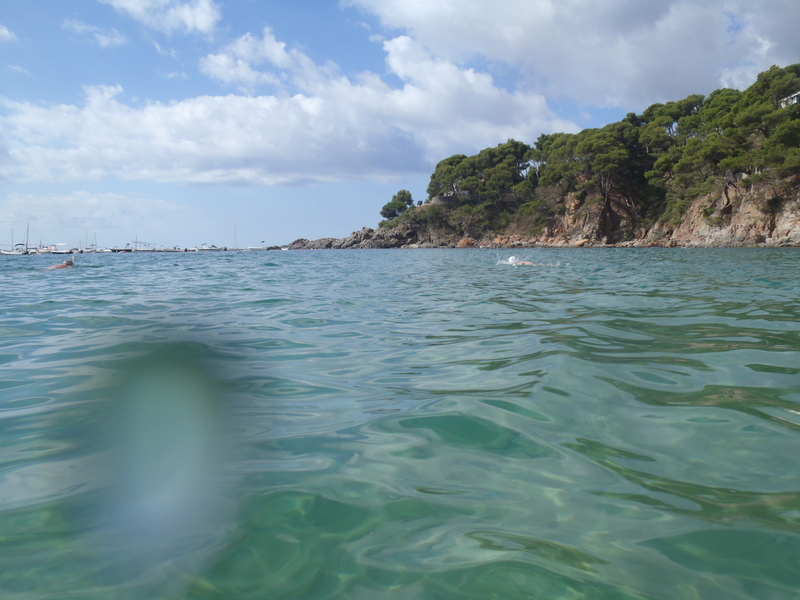 More than just embracing open water, the Costa Brava is making it easy for open water swimmers to feel confident, safe, and encouraging open water adventures! 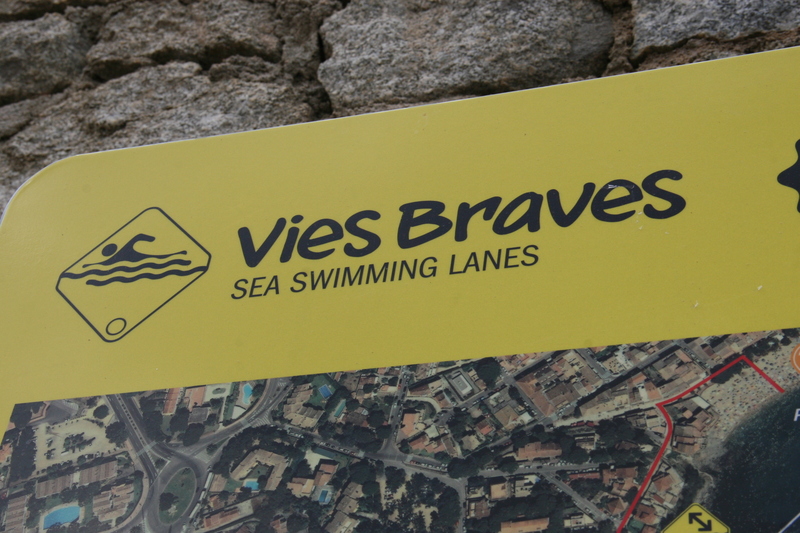 With 10 open water swimming “lanes”, the Vies Braves offers adventurers an entirely different way to get to know the Costa Brava. My only disappointment was that I hadn’t planned ahead to try all 10 lanes! I decided I would try the course the next day. 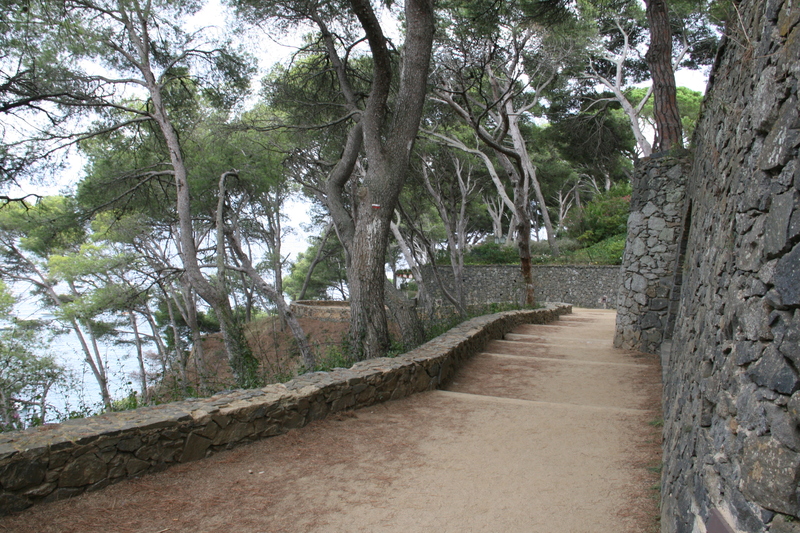 And on the way back to Llafranc, saw others taking to the lanes. 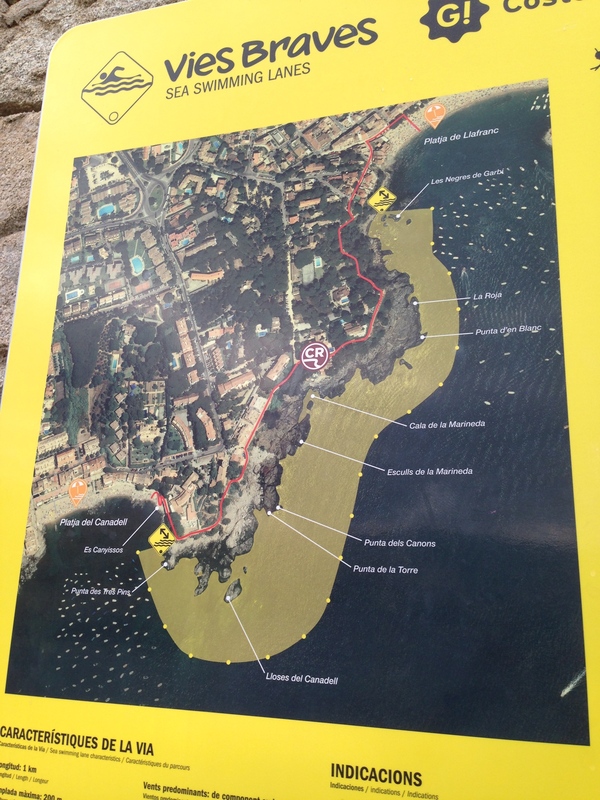 Another open water swimmers dream? 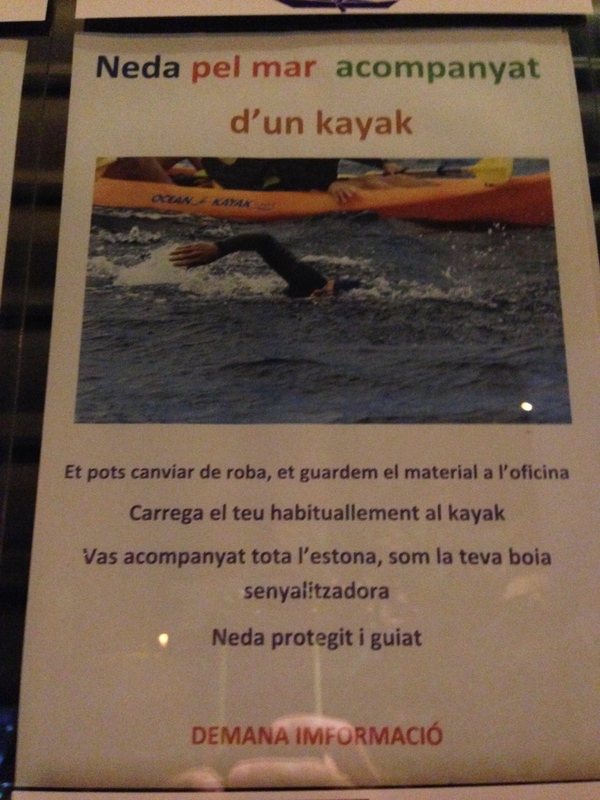 At the tourism office, you could actually hire a kayaker to act as a support boat! I have never seen anything like this in the U.S. Have any of you?? The next morning, it was sunny and gorgeous and perfect for swimming! I swam back and forth and back and forth and back and forth, but this time it was from town-to-town. 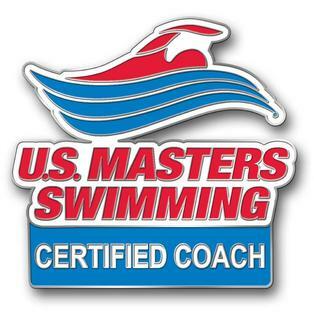 I passed other swimmers along the way. 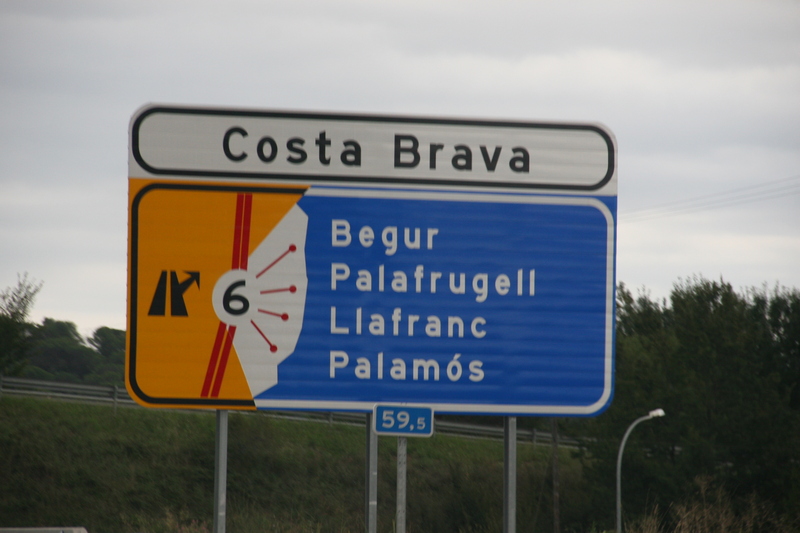 I fought the chop of the Mediterranean. I looked at fish. 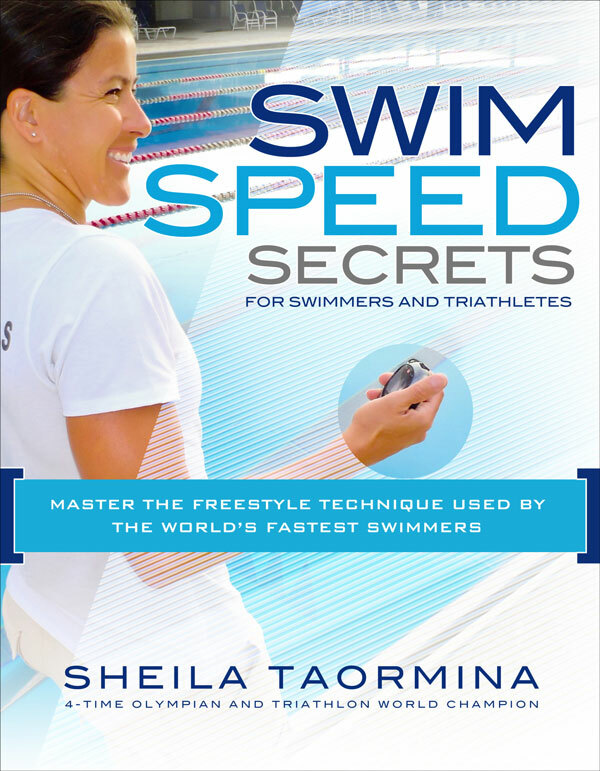 And I thought about how once again, being an open water swimmer had given me a way to explore and learn about a place in a way few are able to do. It was fantastic. And I did it again the next day, and the next. 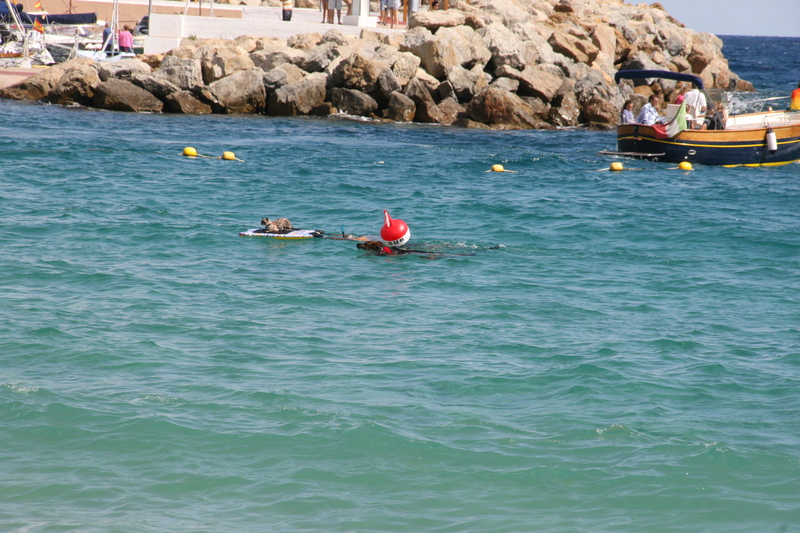 It was also in Spain that I witnessed my favorite open water moment of all times. I have, really, no words for this. Yes. You are seeing correctly. 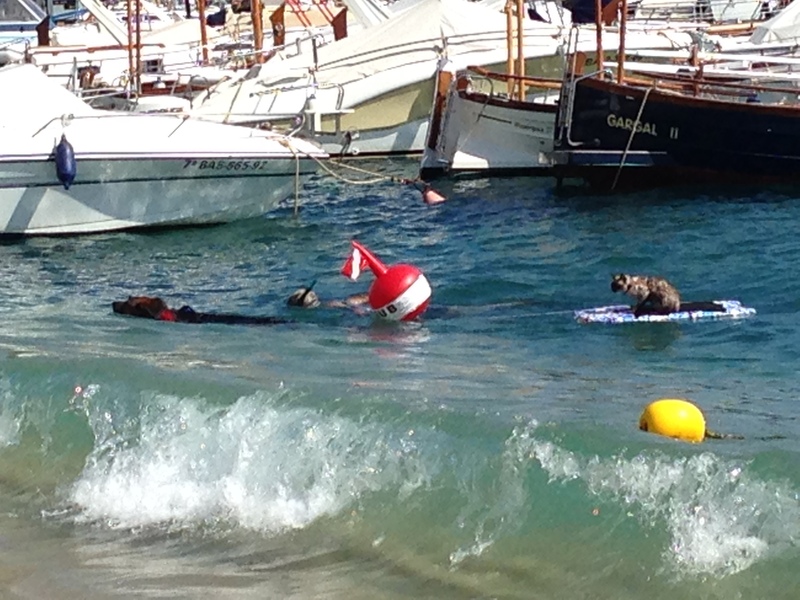 That is a man, swimming with a buoy, and also, with his dog, who was wearing doggie water wings, and HIS CAT RIDING ON A BOOGIE BOARD! HIS CAT. RIDING. ON A. BOOGIE BOARD. 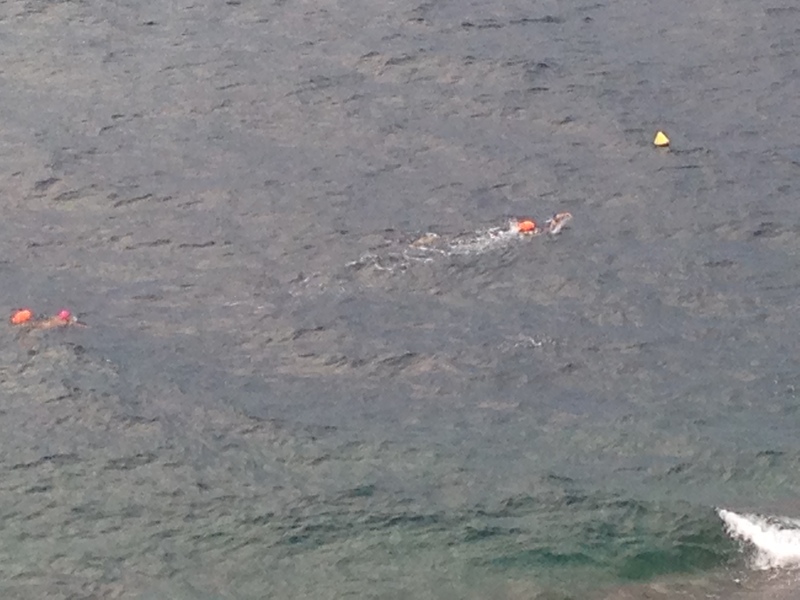 This man wins my award for open water swimmer of the year.